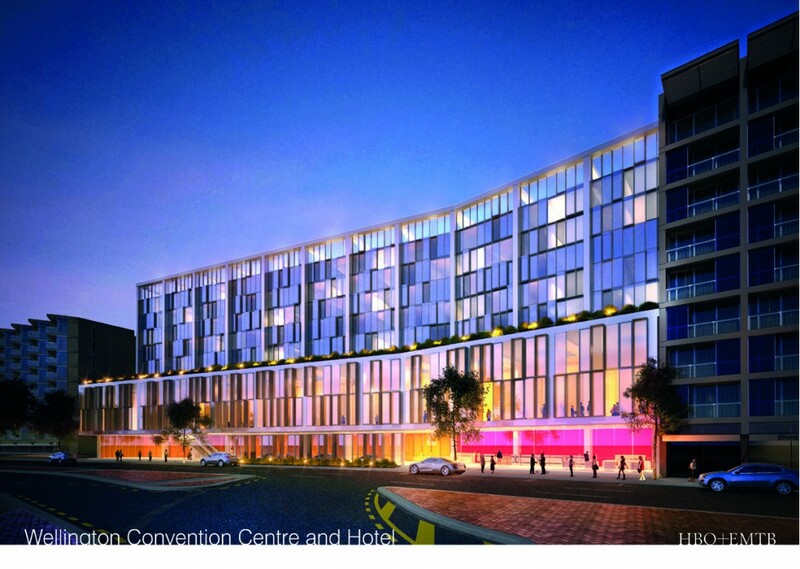 The Convention Centre proposal comments are due by the 8th August ie Friday. 14th August at 5.00pm. Here is my submission to Wellington City Council. The proposal to build a combined Convention Centre and Hilton Hotel is a good proposal for Wellington, and it should be encouraged to go ahead, with some strong urban design amendments. The good points about the proposals are that it is well-situated in the middle of the city, it has potential for good linkages to Te Papa and to the waterfront, it will be near an area of high activity and hospitality / entertainment, and that the influx of people from a large convention will have the potential to prove a economic boon to the Te Aro area, as well as the people of Wellington. It has a hotel for use of high-paying guests, and is near to other hotels and high end apartments. Overall it is a good use for the site and certainly better use than the car yards that have occupied the site for years. However, there are amendments that urgently need to be made to the scheme. In terms of urban design, we have been given next to no information to go on. Judging by my quick mash-up though, this scheme is a potential killer of street life and needs to be adapted to improve its fit into the city. Convention Centres and large hotels can be, and often are, bland and deadly dull interventions into the cityscape, and as currently proposed this has the potential to be the same. Architecturally the convention centre at ground floor is bland and monotonous along the street edge to the front, and we know nothing about the extent towards the rear. What we do know however is that the site exists in an area that can link together many parts of the downtown Te Aro area. It links directly across to Te Papa. It has linkages across Wakefield St to the proposed Countdown and to the existing Courtenay Central food court / entertainment centre. 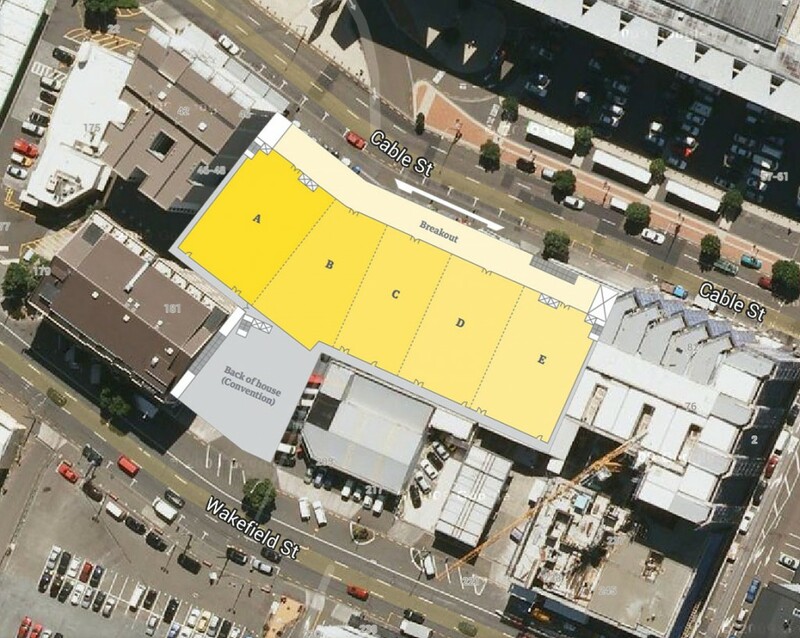 It has links to the massive carpark at Courtenay Central, which presumably will be fixed one day and take its place again as part of the urban infrastructure of Wellington. It is near to the main public transport route down Courtenay Place, and the linkages through to the entertainment precinct need to be strengthened and made more explicit. The two existing roadside pavements at Tory St and Taranaki St are inadequate routes to take the flow of people from the proposed Convention Centre, yet it is too close to get a taxi. We want the people going there to walk within the city, not to drive. The Council needs to ensure that the ground floor has continuous retail frontage to both the Wakefield St and Cable St facades of the building, rather than blank walls and fire exits. The people of Wellington are being asked to approve or otherwise consent a large building with a lasting effect on the city for the next hundred years, without having seen anything other than a glitzy corporate promotional rendering, and no coherent plans or elevations. The scheme is being promoted by property developer Mark Dunajtschik, and the Council’s urban designers need to be able to stand up for Wellington and ensure that the best result is gained, not just in monetary terms, but also in the look, feel, and practical usage of the scheme for the city. Council’s much-vaunted desire to build a system of small scale Laneways through the city, as evidenced by the work put into the Opera House Lane, could be adapted and enhanced by this project, adding to the vibrancy and permeability of the city. Or it could ignore its own advice, and build a bland, blank, monument to corporate functions with little or no interaction with the city. We, the people of Wellington, need to ensure that it is the former, and not the later. Note – date revised in this post – submissions are due by the 14th August, not the 8th. Comments welcome on my comments? And, can anyone tell me, where abouts on this plan does the actual Hilton go? The glitzy elevation from the official promotion appears to show the Hilton Hotel part set back from the street, presumably so the Convention centre part can have large open-plan floor spaces. So, is the actual hotel therefore going to be situated more on Wakefield St rather than Cable St, ie above where it says “Back of House Convention” and that run-down former service station? That would make more sense, and clean up that part of the city, as well as pushing the hotel’s front windows further away from looking straight into Te Papa’s windows. Perhaps it would also gain some good side views out to the harbour? I wonder if anyone from HBO+EMBT would care to comment? Needs more of this and less of this. And correct, they only have the two renders plus a “floor plan” on the brochure. Distinctly lacking for such an important project. (Supposedly) the WCC Urban Design team has been rendered a toothless tiger in recent years, but COME ON! This needs to be sorted or we will be stuck with a concrete (no offense 60MPa) lemon. Our ‘urban’ will not be urbane. PO Box 2199, Wellington 6140. Thanks m-d i had forgotten to put in a link to that. SeaMonkey – yes, it is all remarkably missing on information, except for the PWC Business Case, which is clearly all that the Council thinks the city deserves a say in. Design is just as important as Business Case scenarios…. I think WCC are only asking for consultation on the idea of partnering to realise the convention centre, rather than the actual design of it – I expect that will come later. It is a bit difficult to tell when the online submission tool is broken at the moment… do they really want to hear what i have to say – maybe not! 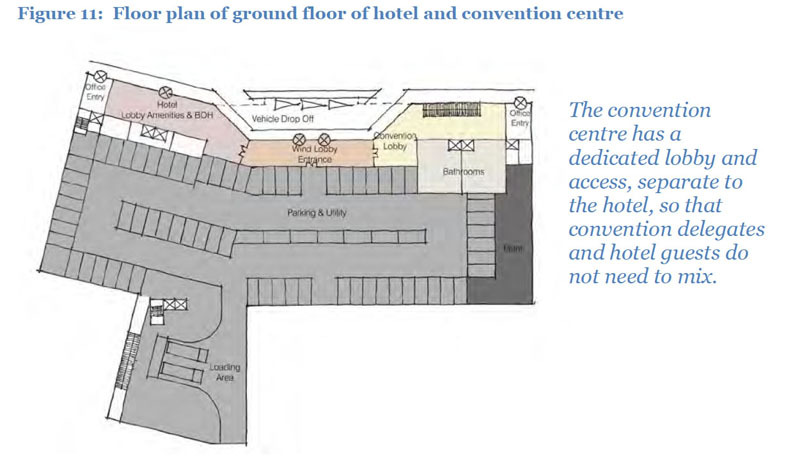 I believe the hotel is simply the angled block above the A-E ground floor convention areas. I don’t think there will be too much issue of looking into each other’s windows between the Hilton and Te Papa, given that Te Papa is fairly blank on that side, and that sort of thing is de rigeur for city hotels anyway. The linkages is a sticky one. On the one hand, I think introducing ‘laneways’ is a great idea, but on the other hand I know that a privately owned lane, with schtick corporate retail, will only lead to a shopping mall type atmosphere – precisely the place I don’t want to see, and quite the opposite of the value of the whole laneways concept. I’d like to be more optimistic about the possible outcome, but I’m too much of a realist I guess. It is the messy vitality of a jumble of small and divergent businesses that would be difficult to achieve in the given situation. I’m also wary of giving up on the existing street routes, and internalising the circulation for what would inevitably become privatised profit. A better answer in my mind is to improve the Tory and Taranaki linkages – this would offer far more benefit to the city to my mind. I’d also like to see a front door on Wakefield Street too, but can see the difficulty in realising that without further property acquisition/site amalgamation. I’m wondering whether the sliver of building indicated to the left of the back of house block actually is a pedestrian backdoor to Wakefield street – if it is, it is pretty mean, and not a great place to be exiting next to a service driveway. I would have preferred the development to take up the CDE area and the site facing Wakefield street immediately south of that. Leave parts A,B and the current proposed Back of House, as a pocket park – thoroughfare through the block – thus being of benefit as space for the convention centre/hotel, and the city. That might also give the owners of the carpark next to Reading some impetus to develop that site. it has a huge amount of info re the market supply/demand in Auckland, Christchurch, Rotorua, Queenstown, and Wellington. I looked at that, but don’t you think it a bit disingenuous to talk about rising global demand, and then only compare with local supply. Surely there is a huge rising global supply also – are we about to enter into a glutted market – who knows, the data hasn’t been provided for us to make that decision on. Where are the huge hordes of convention going spenders needed to make all of these centres break even going to come from?!? For the most part, Wellington is facing competition from other NZ centres. Auckland will have the biggest Convention Centre, since Johnkey’s shonkey deal with SkyCity, but other big centres for Conventions are apparently Queenstown and Rotorua, as apparently that is where the tourists want to go. Domestically however, Wellington has just edged out Auckland as the destination that people within NZ would most like to go to – yes, we are the MOST popular domestic tourist destination. So, we are really not that much in competition with OZ, Singapore etc for conferences, but we are in competition domestically. and here is the link to the Half billion dollar Christchurch Convention Centre, of which the Taxpayers will pay about half…. We are jumping on to this particular bandwagon very late – when it looks as though it is already past its peak. Don’t get me wrong, I like the idea of a decent development at that site, but I’m not very optimistic about its success. And that would be okay if it weren’t another example of socialising the costs/losses, and privatising the profits. Put it this way – if the numbers stacked up in an economic sense, there would be no need for corporate cap in hand approaches to the ratepayer to fund such things. Maybe once this is built the muppets at the WCC will finally put a pedestrian crossing on the west side of Tory at the Wakefield intersection. Alan – exactly. Really slack. So, the proposal is not so much “do we want to leap onto this convention-centre bandwagon”, and more as “how do we stop losing everything we already have”….. Interesting to see that while our Council is dipping into our pockets for this (you know they could actually just walk away from this commercial service provision! – if there is a real case for it, someone will fill the gap), the Govt is dipping into our pockets for a much bolder (that means more expensive) and larger one in Christchurch! I never knew I needed a convention centre so badly! Max – perhaps charitable in the operative sense is applicable – like, business needs charity (i.e. ratepayer largesse) to survive. Actually, isn’t the developer the one who is so broke that he can’t afford to strengthen the heritage building that one of his unimaginative developments compromised? Also, one has to wonder why Convention centres are the big thing when international travel is likely to become adversely affected by reduced supplies of increasingly expensive fossil fuels, especially since international oil supplies are being threatened by wars and subject to the control of states that are no longer disposed to bowing to ‘western state’ pricing edicts. Also,as small scale suppliers at the arse end of the world in an industry dominated by Christchurch and Auckland which will be taxpayer subsidised, are the Wellington ratepayer subsidy estimates even half-way realistic. One only has to look at how far astray the WWL projections have been. That said, perhaps the designated Councillor and relative of the Minister of Finance has some of the Bill English voodoo economics and bulldust magic to make it work, but being a cynic ….. I think I’m actually more concerned about the fate of the Old Town Hall, where people are now talking about it being left as a “shell”. These matters are all so closely tied together. Town Hall, Convention Centre, Economic Case For and Against. I hope that WCC doesn’t get shafted by Dunajtschik and the Property Council big boys.